Hiking dates are determined by the availability of guides. Please contact reservations and they will do their best to accommodate you with your preferred dates. Guests hike in groups of between 2 and 12 people with either one or two guides. No exceptions can be made to the group size. The trail is closed from mid December until early January. Due to the nature of the trail we regret that we do not accept bookings for children under the age of 12 years. No upper age limit has been set as it is determined purely by the fitness of the individual. 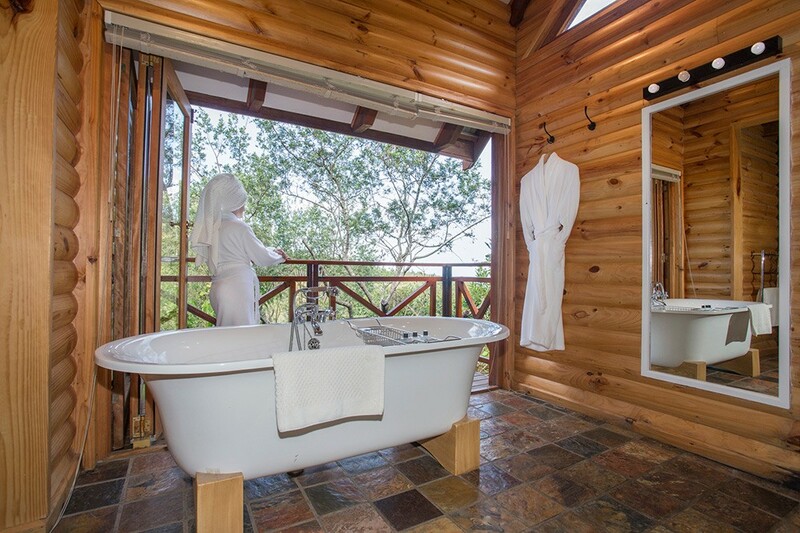 The rate for the current season, ending on the 31st October 2013, is R 4,990 per person sharing and R5,940 per person single. We are hoping not to increase the rates for the next season 1st November 2013 to 31st October 2014. The rates therefore remain as above. 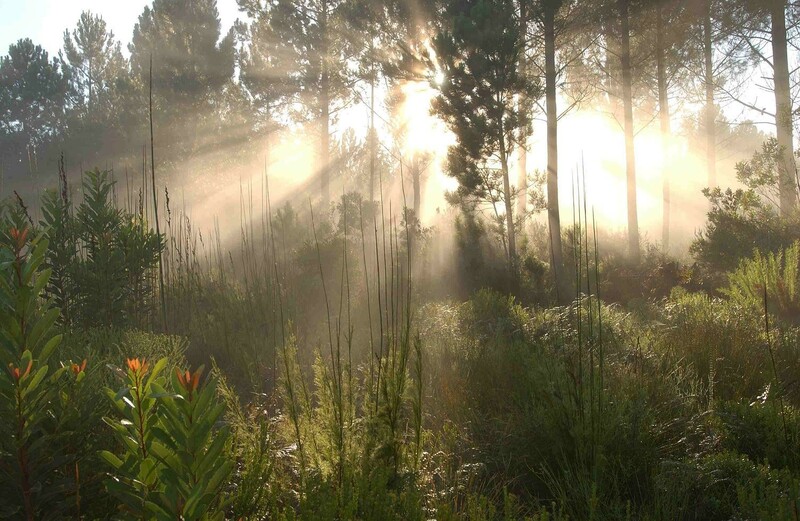 This unique trail has been made possible by the formation of a partnership between South African National Parks, and two private sector partners, namely The Fernery and Misty Mountain Reserve. The result is a hiking experience that will both challenge and pamper you. 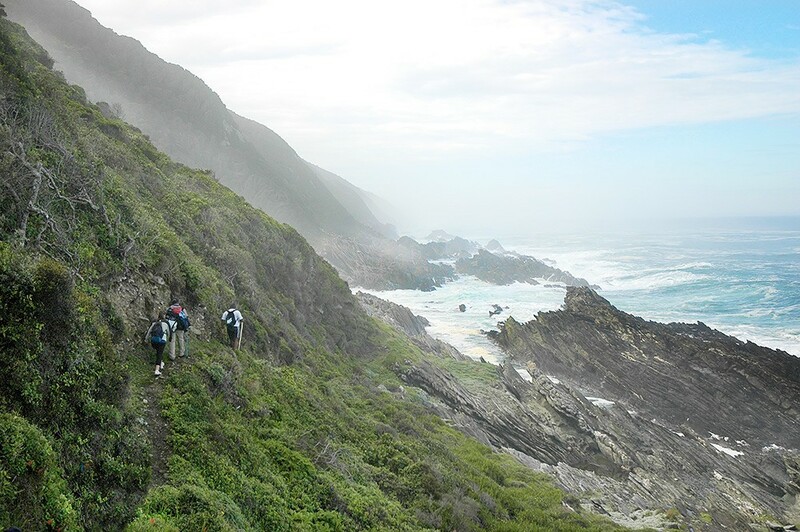 The trail covers a distance of 17km starting in the unrivalled beauty of the Garden Route National Park (GRNP) - Tsitsikamma Section at Storms River Mouth, and winds its way eastwards through natural fynbos and pristine indigenous forest, over rugged rocks at the waters edge, to end on the banks of the Sandrift River at The Fernery. 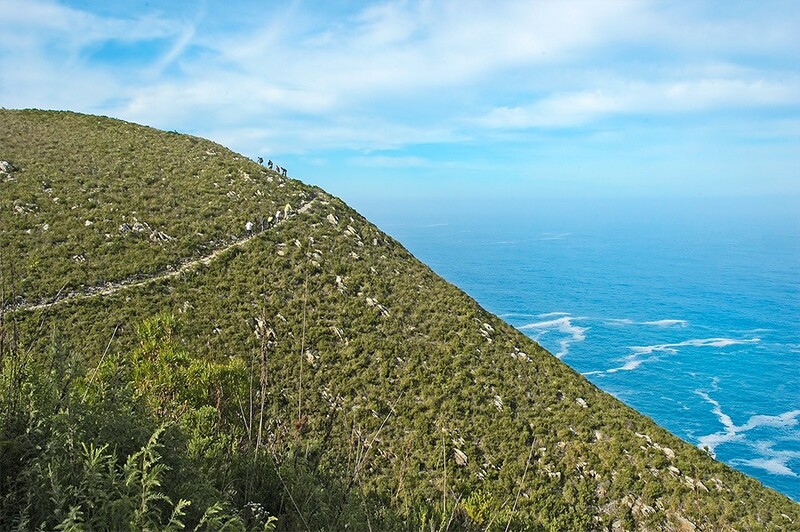 Hikers have stunning views of the rugged Tsitsikamma coastline, and the chances of spotting whales, dolphins and the occasional otter are good. On route, many birds including the gorgeous Knysna Loerie can be heard and spotted while hiking through the forest, and the endangered Oystercatcher is often to be seen on the shoreline. 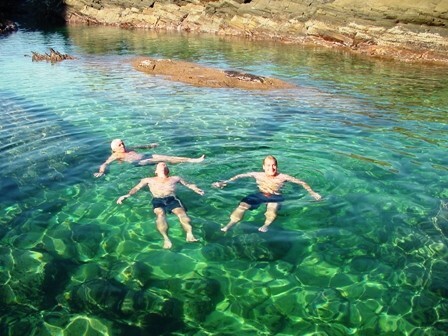 Swimming and snorkelling in the rock pools is possible at the discretion of the guides. Check in is any time 2:00PM at the GRNP - Tsitsikamma Section Reception. Be sure to have your booking form available as this includes your entry to the Park. 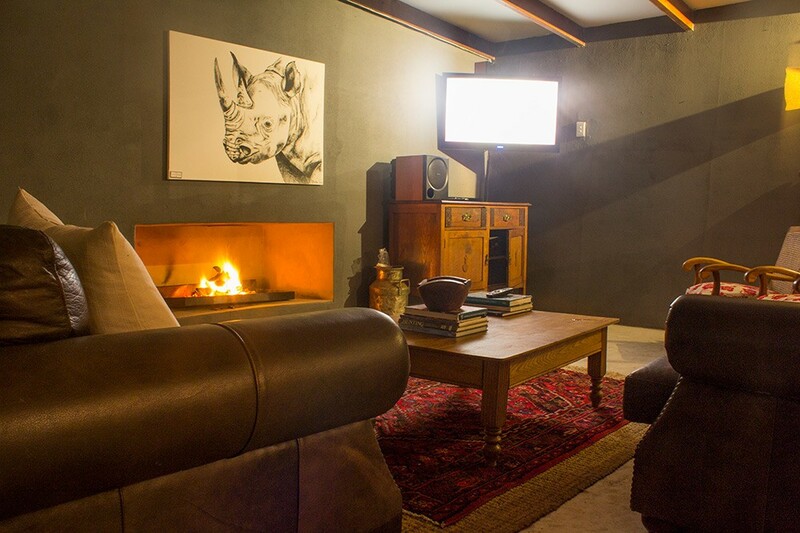 After moving into the quaint Dolphin Trail chalets you are free to enjoy what remains of the afternoon at your leisure. There are a number of bird and hiking trails, including the start of the Otter Trail, that are well worth walking, or you can take time to put your feet up and relax in one of the most beautiful spots on earth! Lunch is not included in the package but if you are hungry there is a lovely outside pub area that serves a variety of meals. 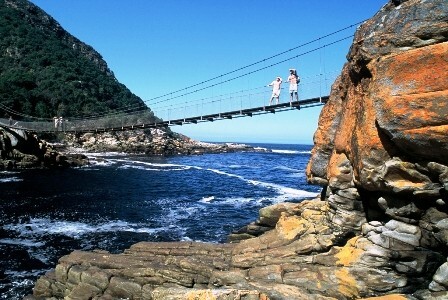 When the group is ready and all drink bills settled, you depart along the boardwalk to Storms River Mouth. 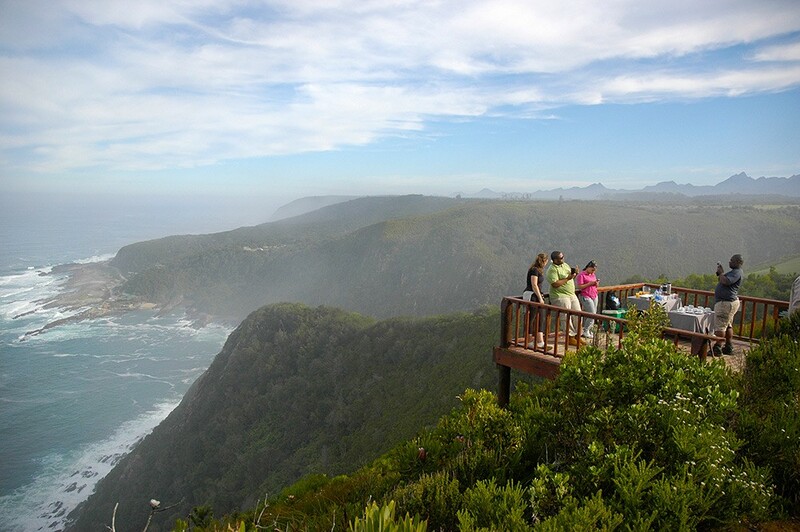 After crossing Storms River on the suspension bridge, you follow a steep and rocky path to the Lookout Point with a magnificent view of the coast towards Plettenberg Bay. 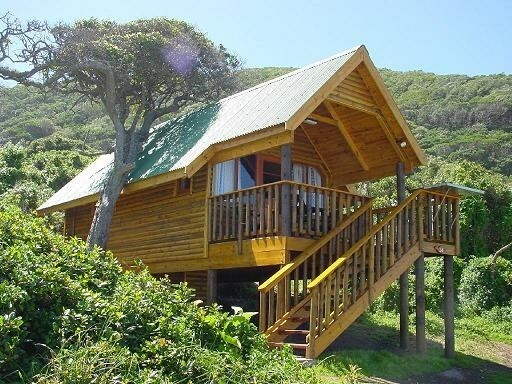 Relax here and enjoy the endless view of the Indian Ocean while keeping your eyes peeled for whales and dolphins. 6:30pm - Meet at the restaurant for pre-dinner drinks and watch the sun setting over the sea, before dinner is served at 7:00pm. 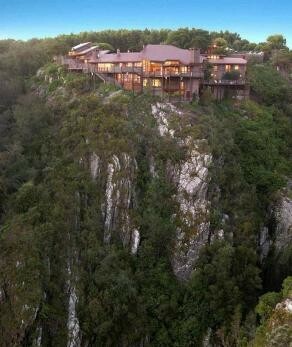 Dinner is from 18h30 at the Fernery restaurant where guests may order from the a la carte menu. 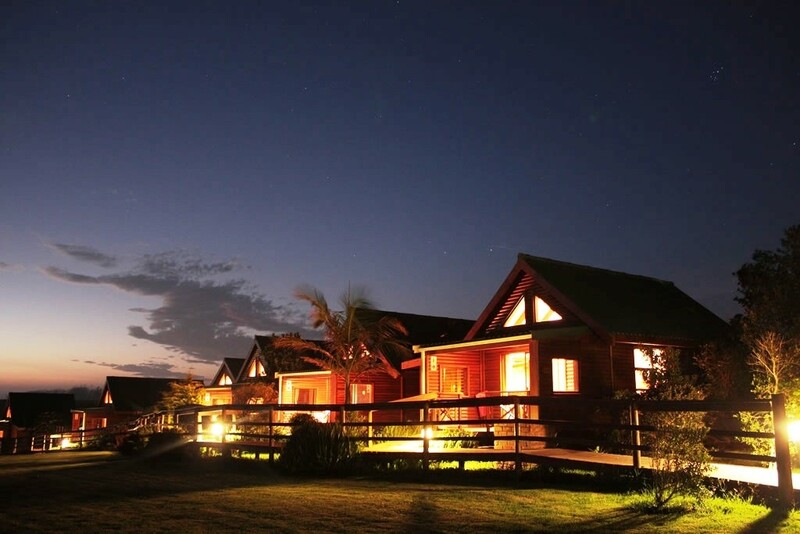 The weary can sleep in and enjoy the peace of their chalets, and early risers are welcome to go bird watching. 8:30am - Breakfast is served at the Fernery restaurant. 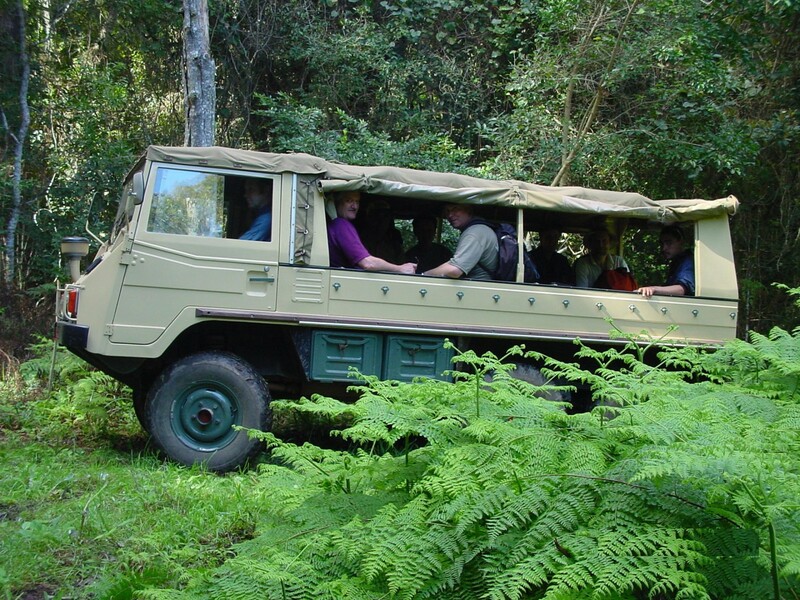 Your luggage is then loaded before setting off on a scenic 4x4 trip through the old Storms River Pass. Before leaving please make sure that you have settled any outstanding bills. 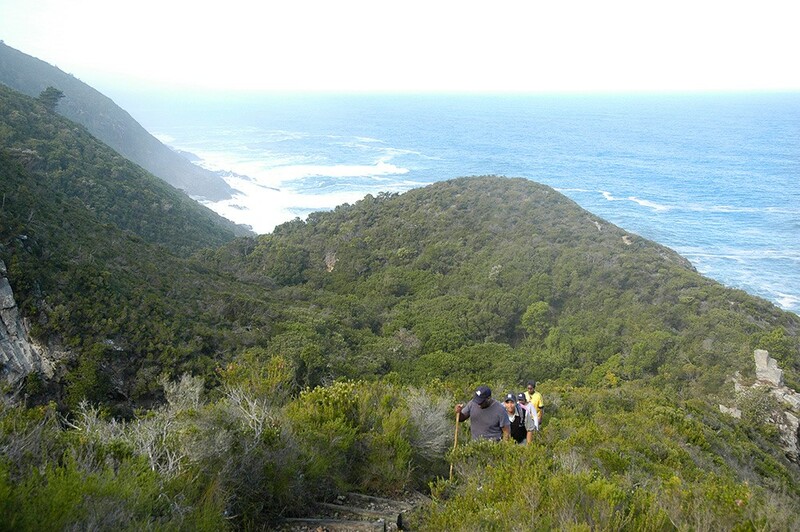 Noon - Arrival at the GRNP - Tsitsikamma Section from where hikers go their separate ways. 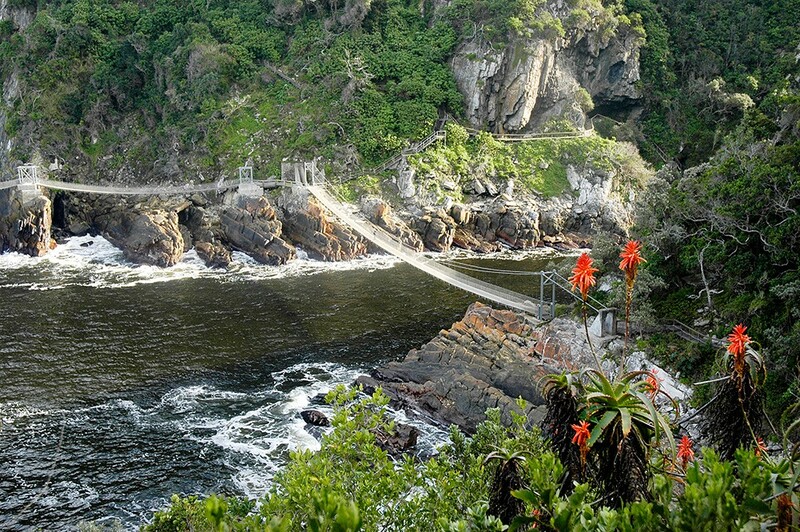 We hope that you have enjoyed your brief stay in our Tsitsikamma Paradise and look forward to welcoming you back soon ~ The Dolphin Trail partners and staff. 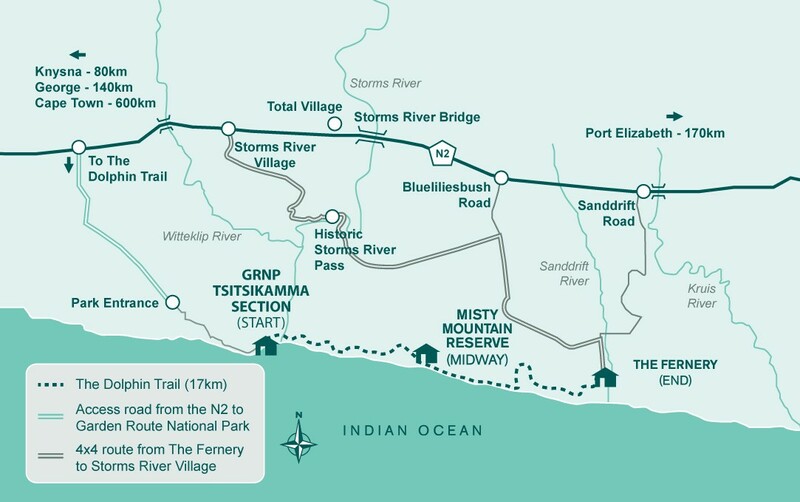 Check in for the Dolphin Trail is at the Garden Route National Park (GRNP) - Tsitsikamma Section rest camp, which is situated at the mouth of the Storms River. This is where you park your car for the duration of the hike and where you spend your first night. 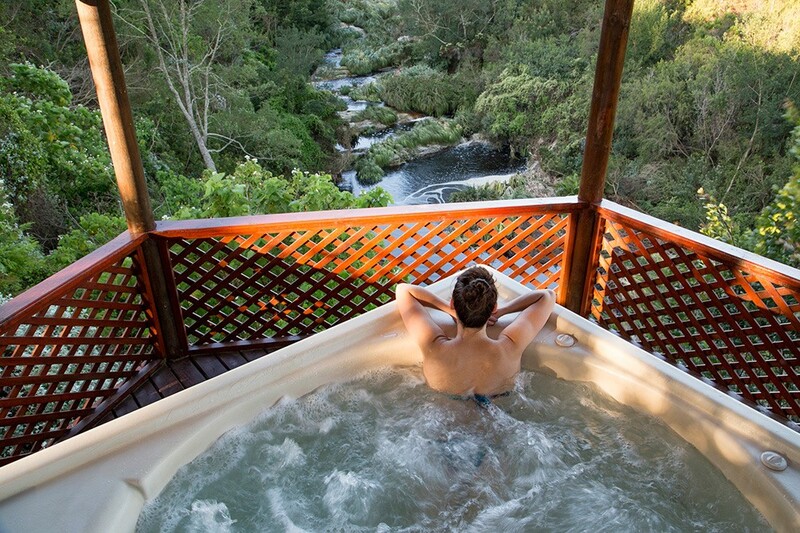 (a) When travelling from Port Elizabeth & Jeffreys Bay on the N2, cross the Storms River bridge and after 4km pass the entrance to Storms River Village on your left. 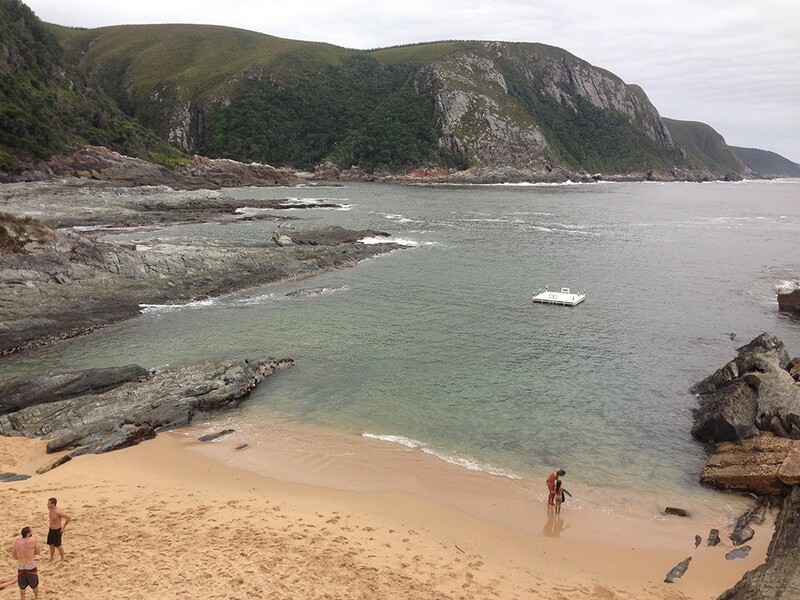 Continue for a further 4,5km and turn left onto the Storms River Mouth / GRNP - Tsitsikamma Section road. (b) When travelling from George & Plettenberg Bay on the N2, pass through the Tsitsikamma toll gate and continue for 30km after which you will pass BOSKOR sawmill on your left. 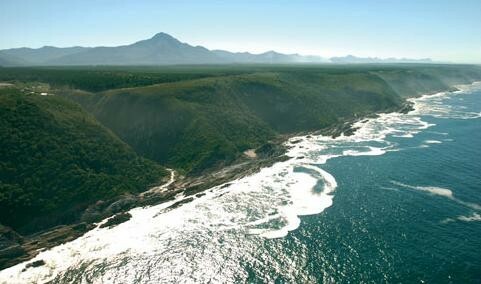 1km beyond the sawmill turn right onto the Storms River Mouth / GRNP - Tsitsikamma Section road. Continue on the Storms River Mouth / GRNP - Tsitsikamma Section road until you reach the security booms at the entrance to the Park. You will gain free entrance as a Dolphin Trail hiker, so please have your reservation papers available. After passing security, turn left and check in at the National Park reception.